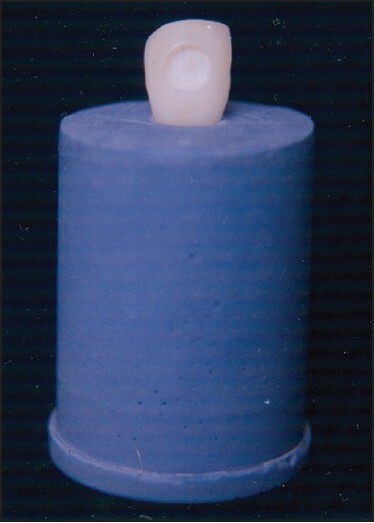 Introduction: Composite material used with bonding system are technique sensitive and contamination of an etched surface by saliva or blood plays a key role in bonding efficacy. Achieving good moisture control is a common problem encountered and is of importance while treating a pediatric age group since rubber dam in dental office is commonly applied in fewer than 10% of restorative treatment. Despite the advantage of rubber dam application, usage of rubber dam depends on child's behavior and its level of co-operation for which pediatric dentists compromise with its usage. This study was conducted to evaluate the effect of salivary contamination of enamel and dentin on bond strength of two adhesives. Materials and Methods: An in vitro study comprised of test group of 112 central incisors divided into 4 groups for testing on enamel and dentin separately. These are Group I: Control group without salivary contamination; Group II: Contaminated with saliva and air-dried; Group III: Contaminated with saliva, rinsed and air-dried; Group IV: Coated with adhesive, light cured and then contaminated. Shear bond strength was calculated using universal testing machine. Results: For testing on enamel and dentin, significantly decreased bond strength was seen with Group II (P < 0.05) and Group IV (P < 0.01) showed decreased bond strength, whereas bond strength of group III was not significant (P > 0.05), when compared with control Group I. Conclusion: The decontamination method used in this study by rinsing the contaminated cured adhesive layer that did not reverse the harmful effect of salivary contamination. As most of the children are active and restless with swinging mood, it is important not to negotiate with the procedural steps during treatment. Adhesive systems are widely used in daily clinical practices with constant development in technical simplification and minimized procedural errors. Composite materials used in conjunction with bonding system are extremely technique sensitive. The chemical composition of these adhesive agents, along with the status of the tooth surface prior to restoration determine the bonding efficacy. Contamination of an etched surface by saliva, gingival fluid or blood is a key factor in bonding. Achieving good moisture control is a common problem encountered and is of importance while treating a pediatric age group since rubber dam in dental office is commonly applied in fewer than 10% of restorative treatment. , Despite the advantage of rubber dam application, usage of rubber dam depends on child's behaviour and level of cooperation for which there is a compromise with its usage. Thus an in vitro study was conducted to evaluate and compare the effect of salivary contamination of enamel and dentin on bond strength of two adhesives. *Why this paper is important to pediatric dentist? Pediatric dentists often come across cases of anterior teeth trauma requiring restoration or splinting of tooth with the usage of adhesives. Treatment depends the child's level of co-operation, posing a clinical challenge. * What this paper adds? Contamination or rinsing of cured adhesive layer must also be avoided. It re-emphasizes the need to follow moist bonding technique and avoid air drying without compromising while treating a child patient. Contamination of an etched surface by saliva, gingival fluid or blood is a key factor in bonding. Achieving good moisture control is a common problem encountered, and it is of importance while treating a pediatric age group since rubber dam in dental office is commonly applied in fewer than 10% of restorative treatment. , Despite the advantage of rubber dam application, usage of rubber dam depends on child's behavior and its level of co-operation for which pediatric dentists compromise with its usage. Thus an in vitro study to evaluate and compare the effect of salivary contamination of enamel and dentin on shear bond strength of two adhesives was carried out. The present in vitro study was conducted in the Department of Pedodontics and preventive Dentistry, College of Dental Sciences, Davangere, Karnataka, India in collaboration with the Central Institute of Plastic Engineering Technology, Mysore, Karnataka, India to evaluate the effect salivary contamination of enamel and dentin on shear bond strength of two adhesives and to compare the bond strength of adhesives under salivary contamination. 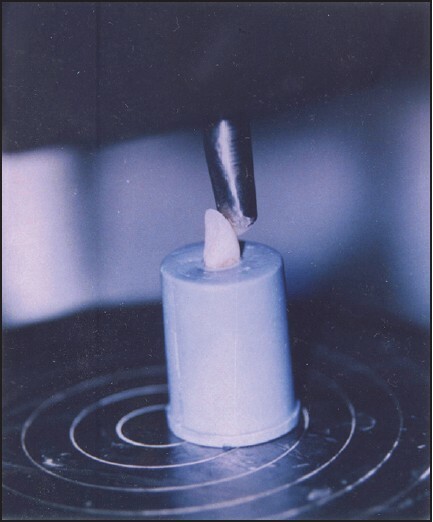 For bond strength testing on enamel, labial surface was grinded with silicon carbide disc to expose the enamel rods. 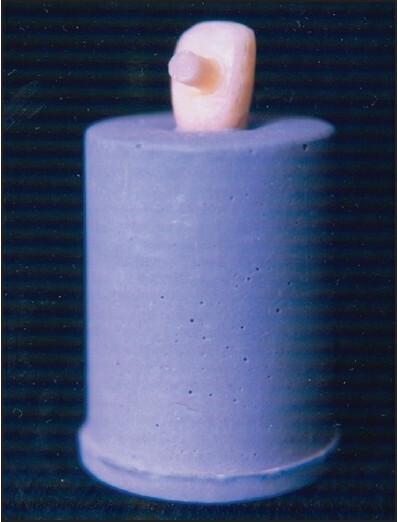 For bond strength testing on dentin, the samples were abraded on the middle third of the labial surface using a #016 straight fissure diamond point (MANI, Guangdong, China [Mainland]) [Figure 1] But joint cavities were prepared in dentin to a depth of 1.5 mm. Adhesive tape with 5 mm diameter was affixed to the bonding site. Control group without salivary contamination. Pre-treatment with etchant, primer and adhesive (Scotchbond MP [3M, St. Paul, MN, USA], Singlebond [3M, St.Paul, MN, USA]) application was carried out according to manufacturer's instructions. Contaminated with saliva and air-dried. After the specimens were etched, rinsed and excess water removed with blotting paper, fresh whole saliva from a patient was collected with cotton tip applicator and applied. It was then left undisturbed for 15 seconds and later removed by compressed air. Contaminated with saliva, rinsed and air-dried. Procedure was same as for group II; however, after contamination with saliva, surface was thoroughly rinsed with water for 10 seconds and then blot dried. After light curing, matrix was removed and resultant cylindrical composite resin specimen served as a handle for bond strength testing. Samples were stored in de-ionized distilled water during testing procedure and kept in Humidor at 37°C for 24 hrs prior to shear loading on Universal Testing Machine (INSTRON, LLOYD), [Figure 4] at a crosshead speed of 1.0 mm/min. Shear bond strength values (Mpa) were calculated from peak load at failure divided by the specimen surface area (3 mm). Results obtained were statistically analyzed by a statistician (double blinded) using Analysis of variance (ANOVA) Duncan's Multiple Range test-(using Software-Statistical Package for the Social Sciences software (SPSS Version 15.0, 2006, IBM). 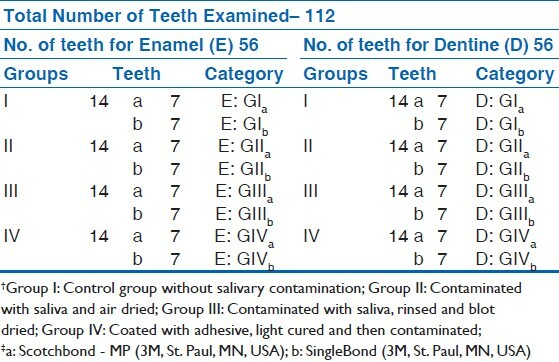 The summary data for all groups are shown in [Table 2] and [Table 3] for testing on enamel and dentin, respectively. Results of shear bond strength on enamel showed Group II and Group IV showed significantly decreased bond strength when compared to group I (P < 0.01). Group III, that is the group in which salivary contamination was rinsed before light curing of adhesive, showed no significant difference as compared to group I [Table 2]. Group IV i.e. group in which salivary contamination was done after light curing of adhesive, showed significant decrease in bond strength (P < 0.01) when compared with group III. Results of shear bond strength on dentin showed that Group I had significantly higher bond strength when compared with Group II and Group IV (P < 0.01) [Table 3]. Group IV had significantly lower bond strength (P < 0.01) when compared with group III [Table 3]. The search for improved adhesive materials has been the object of research in recent years. Adhesive of composite to dentin proved to be more difficult due to complex histological structure and variable composition i.e. enamel is 92% inorganic by volume as compared to 45% inorganic on an average. Also, contrast to regular arrangements of hydroxyapatite crystals in enamel, dentinal hydroxyapatite is randomly arranged in an organic matrix that consists primarily of collagen. Application of bonding agents either involves three-step or two-step procedures using etchant, primers and adhesive application. A sixth generation bonding agent (prompt-L-pop) though minimizes, the steps in application remains technically sensitive. These requirements add practical difficulty to maintain isolated surface for effective bonding especially while working with children. The results of this study for testing on enamel and dentin, showed Group II and Group IV with decreased bond strength, whereas bond strength of group III was not significant when compared to control Group I. Results in this study on dentin showed significant reduction in bond strength in group II and group IV. In Group II, where contaminated saliva was removed by air drying, the decreased bond strength may be due to the adsorbed salivary glycoproteins blocking the dentinal tubules as well as exposed peritubular or intertubular collagen network. This prevents resin monomer penetration and subsequent resin tag formation. Air blasting causes collapse and denaturation of collagen fibrils protruding from the surface, resulting in a layer of amorphous material that restricts resin tag formation. Bond strength of Group III was not significantly affected when compared to Group I, the presence of water left behind after blot drying might have prevented possible adsorption of glycoprotiens. Dentin bonding with one bottle adhesive system mainly depends on the presence of water in the interstices of the collagen mesh, which is the dominating factor in moist- or wet-bonding technique. Presence of water in the saliva film left after rinsing probably facilitated penetration of monomer dissolved in volatile and water chasing solvent, the ethanol. In addition, acetone and ethanol reduce the surface tension of water and allow spreading of the mixture along the surfaces that are coated with water. , When acetone primer contacts with water on dentin. The boiling point of acetone is raised and the boiling point of water is lowered, a process called as 'azeotrophism', causing evaporation of acetone and water and resin is left behind. Organic water miscible solvents such as acetone, ethanol have been shown to exert a stiffening effect on demineralized dentin collagen. Stabilization is useful when the collagen matrix is hydrated allowing the integrity of interfibrillar space to be maintained facilitating resin infiltration. , Bond strength of Group IV showed reduction when compared to control group I. The probable reasons could be, adsorption of glycoproteins to the poorly polymerized adhesive surface, where they might act as a barrier that prevent complete wetting with the next increment of resin and thus prevent adequate copolymerization. Compromise of the copolymerization with the subsequent resin layer by the removal of oxygen inhibited, unpolymerized surface layer during rinsing and drying. Insufficient filling of collagen mesh with resin because of oxygen inhibition and also because not also resin occupying the interstices of the collagen meshwork is polymerized. Addition of resin to this altered collagen surface will presumably not result in complete penetration to the level of polymerized adhesive and re-expansion of the network. The long-term effects of saliva contamination are not known. It is conceivable that contamination could result in nano-leakage in the hybrid layer itself. Traditionally, tooth structure has been re-etched to compensate for contamination of tooth structure. Re-application of acid etchant on tooth demineralizes deeper into the dentin than a single application for the same amount of time. This could result in increased risk of nano-leakage within the hybrid layer. This study demonstrated that adhesives are sensitive to salivary contamination. The study showed that a cured adhesive layer when contaminated with saliva, rinsing of the surface with water did not improve the harmful effects of contamination. Secondly, the study insists on following the moist bonding technique and is important to avoid air drying. Clinically, achieving good moisture control in the pediatric age group is challenging. There may be many instances in which saliva and blood contaminates the field despite the operator's best efforts as incase of splinting teeth with traumatic injuries and restorations depending on the level of co-operation. 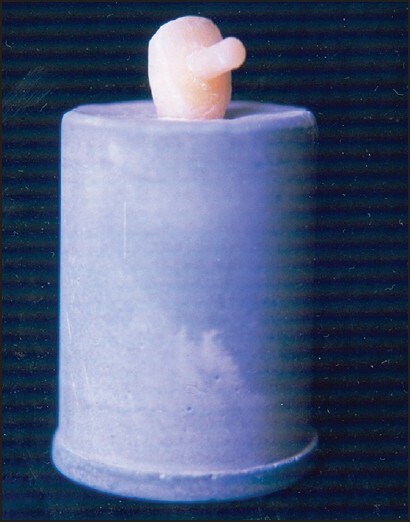 Proper moisture control and effective isolation are still necessary for best manipulation in adhesive dentistry. The limitations of the present study are the varying composition of the saliva and itseffect on the bond strength due to other confounding factors. Moreover, the bond strength may also decrease over a period of time, on exposure to saliva or acidic beverages and due to thermal changes. Since this is an in vitro study, in vivo studies must be carried out to validate the results. 1. Taskonak B, Sertgoz A. Shear bond strength of saliva contaminated one bottle adhesives. J Oral Rehab 2002; 29:559-64. 2. Finger Werner J, Markus B. Rewetting strategies for bonding to dry dentin with an acetone based adhesives. J Adhes Dent 2000;2:51-6. 3. Fritz UB, Werner J Finger, Howard Stean. Salivary contamination during bonding procedure with a one bottle adhesive system. Quintessence Int 1998;29:567-72. 4. Frankenberger R, Perdigao J, Rosa BT. No-bottle vs multi-bottle dentin adhesives - a microtensile bond strength and morphological study. Dent Mater 2001;17:373-80. 5. Finger Werner J, Fritz UB. Resin bonding to enamel and dentin with one component UDMA / HEMA adhesives. Eur J Oral Sci 1977;105:183-6. 6. Hitt JC, Feigal RJ. Use of bonding agent to reduce the sealant sensitivity to moisture contamination - an in vitro study. Pediatr Dent 1992;14:41-6. 7. El-Kalla Ibrahim H, Franklin Garcia - Goday. Saliva contamination and bond strength of single bottle adhesives to enamel and dentin. Am J Dent 1997;10:83-7. 8. Abdalla Ali I, Carel L Davidson. Bonding efficiency and interfacial morphology of one bottle adhesives to contaminated dentin surfaces. Am J Dent 1998;11:281-5. 9. Roeder LB, Sichanthavong J, Powers JM. Bond strength of composite to contaminated dentin. J Dent Res 1997;76:67-8. 10. Kanca John III. Resin bonding to wet substrate bonding to dentin. Quintessence Int 1992;23:39-41. 11. Tay FR, Gwinnett JA, Pang KM, Wei SH. Resin permeation into acid conditioned moist and dry dentin: A paradigm using water free adhesive primers. J Dent Res 1996;75: 1034-44. 12. Burke FJT, Combe EC, Douglas WH. Dentin bonding systems: I. Mode of Action. Dent Update 2000;27:85-93. 13. Pashley David H, Bernand Ciucchi, Sano H. Permiability of dentin to adhesive agents. Quintessence Int 1993;24: 618-31. 14. Tay FR, Gwinnett JA, Wei HY. Micromorphological spectrum from overdrying to overwetting acid conditioned dentin in water free acetone based single bottle primer adhesives. Dent Mater 1996;12:236-44.